I suppose going out for another gigantic moon of greasy, bready Costco pizza is an option for tonight's dinner, but you've already done that, so-many-times. Don't you think maybe it's time to figure out how to feed yourself, with real food? Like with stuff from the food market instead? I do. So here goes another one of my crappy recipes, an easy and quick one that anyone can follow, and it turns out quite nicely as well. I know more than a few people that claim they can't cook and act like it's okay to subsist on eating out. Well, it ain't. You need to get your act together and learn some basics in life, don't assume you'll always have that drive-thru available at all hours. Do you really want to pass the rest of your years subsisting on frozen dishes from Trader Joe's, just because it's easy? All those years of culinary and cultural history passed down thru so many relatives and you decide to squander it for some microwave delight, que lastima. 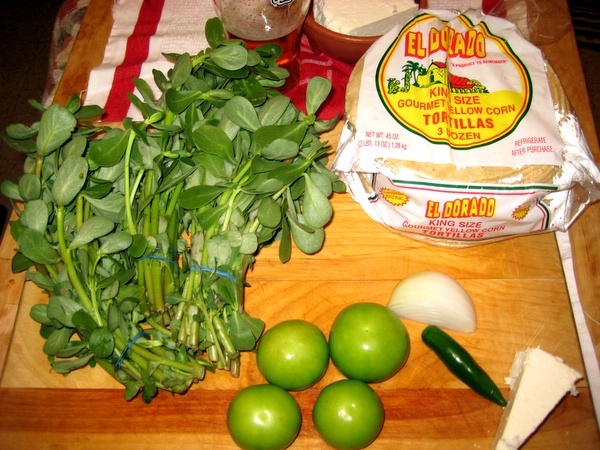 And don't blame it on your mom for your lack of paying attention in the kitchen, I learned how to put some simple dishes together on my own, in my teens, cuz I was tired of having to eat more boiled Lengua when I'd already told my mom I was a good-for-nothing vegetarian. 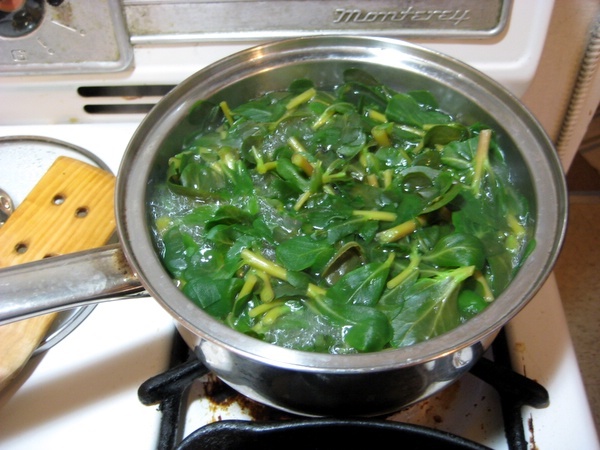 To show you that anyone can learn to cook something new, follow along as I prepare a simple meal with verdolagas (aka purslane) which I never tried until just a few weeks ago. I've heard about verdolagas before and seen them often at the market, but since I knew nothing about them I always gave them a pass. And when I hear the word verdolaga I can only think about the song above by the group P18. "Not everyone can afford to eat high-quality food in America, and that is shameful; however, those of us who can, should." Uhh, thanks for that fine suggestion, pal. In any case, verdolagas are now within reach of the common budget. Even though they grow like weeds, at one time they were considered an exotic food item in this country and affordable only to those with some serious feria, but now you can get three small bunches for just $1.19, like the ones in the pic above. Oh yeah, that pic also shows the rest of the ingredient for this recipe: 4 tomatillos, 1 chile serrano (2 if you want to make things interesting! 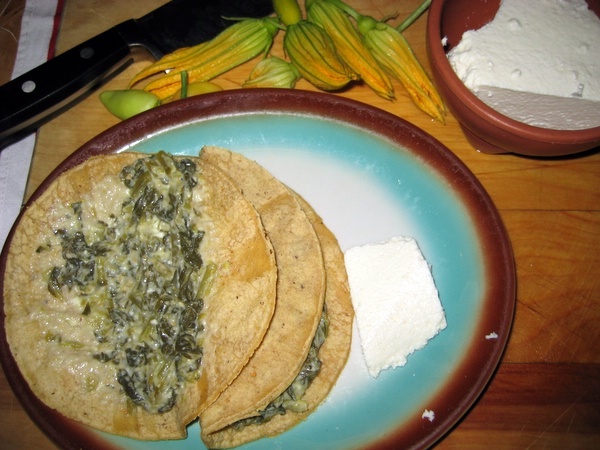 ), a quarter white onion, a bit of queso fresco, and some tortillas. You can also add a clove of garlic to this, but I forgot this time around, maybe cuz I was half-way thru that beer you can see as well! Let's get started. First, clean these weeds well; as soon as I pulled these out from my grocery bag I spotted a little spider running around, which I quickly caught and released. But as I was soaking these in warm water I spotted a bunch of tiny bugs coming up for air, I guess this was a fresh batch. In any case, wash your food. 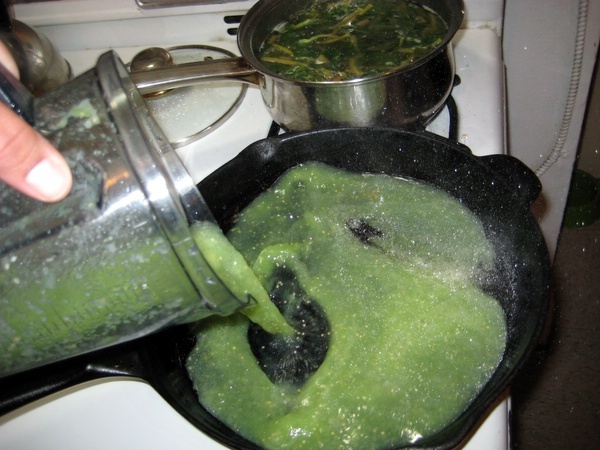 While we let the verdolagas soak, lets get our sauce ready. 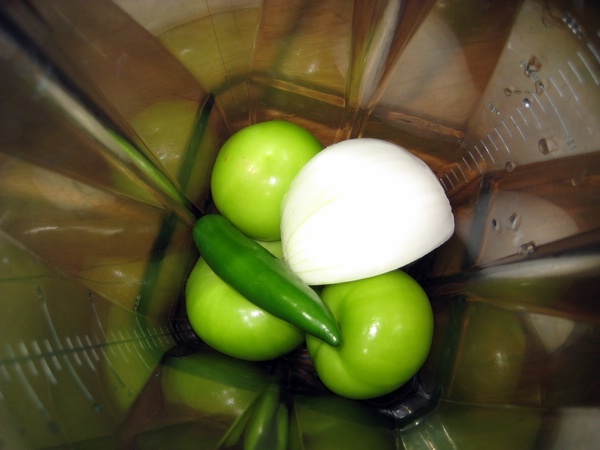 Dump the 4 or 5 tomatillos, the chile serrano, the onion quarter, and a clove of garlic into a blender; add a bit of water to make the blending easier, and hit the power button! Yup, no need to cook these beforehand. Blend until you have a nice smooth liquid base. 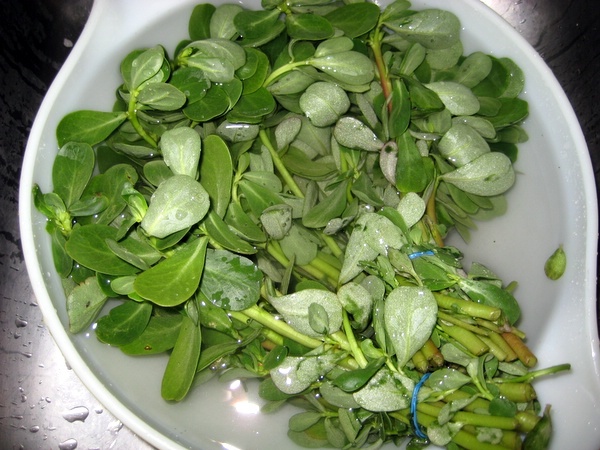 Now that your weeds are nice and clean, cut off the lower woody base, chop the rest into about 3 inch chunks, and put them in a pot of boiling water. Cook them that way for about 10 minutes. Next, heat up a pan, add a bit of oil, and pour the tomatillo sauce in to cook a bit. You might want to be more careful with the splatter then I was. Let the sauce cook a bit and add some salt, maybe pepper, and any other flavors you might want to experiment with. Don't be chicken, nobody's going to grade you. 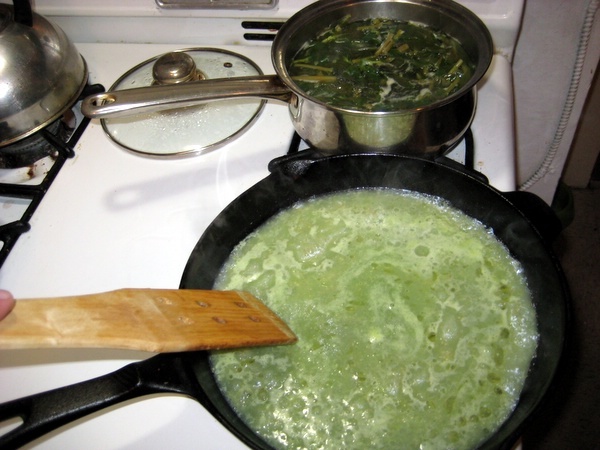 Then add the drained verdolagas into the sauce, where they'll cook down even more. I'm sure there's recipes where you eat them in this state, but I want to make them into tacos, so water be gone! Coming along nicely. Uhh, don't put your wooden utensils on top of a cooking pan, that's only for the pros! Here's where you vegans might want to turn away; I like to add some queso fresco to melt down with the greens, though it can certainly do without it. 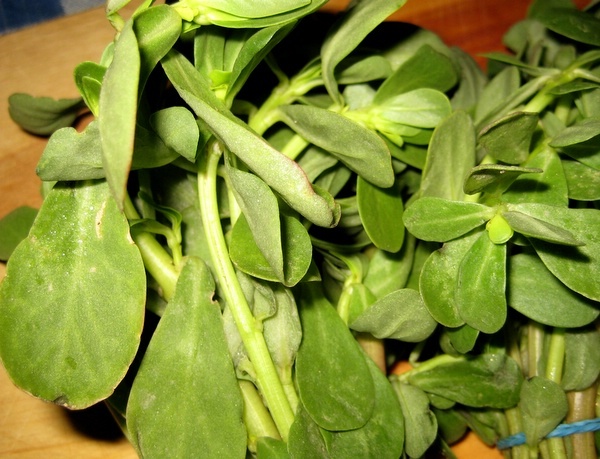 Purslane has an acidic quality that the cheese can balance out, but I'm sure cooking it with some diced potatoes would have the same effect. Almost done! Time to start warming up some tortillas. I'm a fan of the locally made El Dorado "Gourmet Yellow Corn" ones, as they taste like real tortillas. I think they get the gourmet tag because the only ingredients are corn, water, and lime - nothing else! "Regular" tortillas have that and a whole bunch of weird unpronounceable preservatives and who knows what else. You know there's something wrong when gourmet means the simple version from hundreds of years ago. 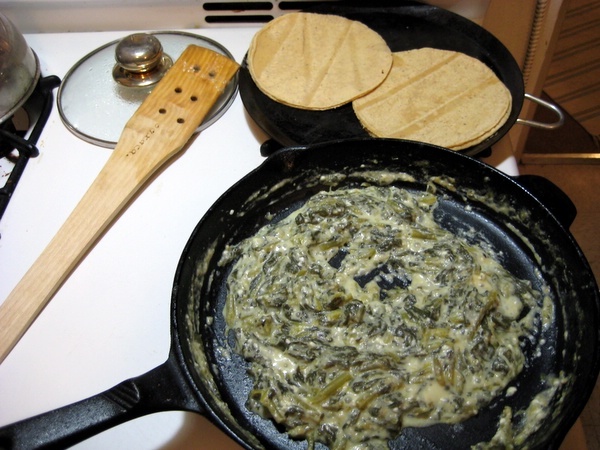 Put some of your cooked greens into a warm tortilla and there you have it, a cheap and easy meal of tacos de verdolagas. How does it taste? 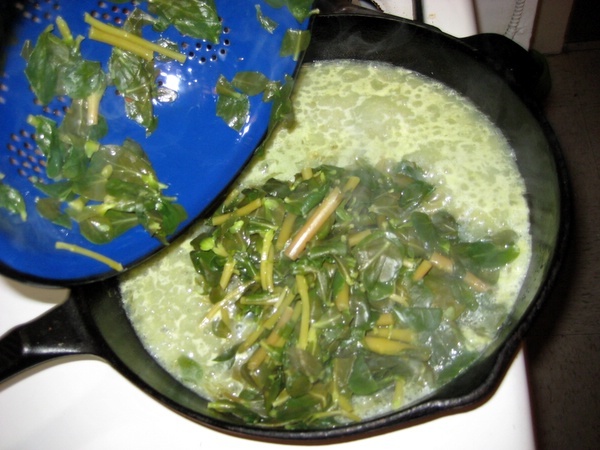 It's a sort of cross between spinach, nopales, and green beans. 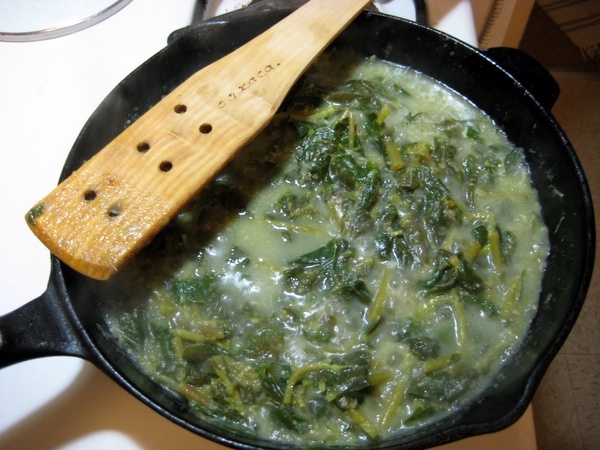 It has an earthy flavor that makes your mouth recognize it as substantial food. But it also has a lightness that makes it taste like a delicacy. And when you break it down price-wise, this is a very affordable and healthy dish you can whip up in less than 20 minutes. I hope you give it a try. Provecho! If you'd like to comment on this article, go here. 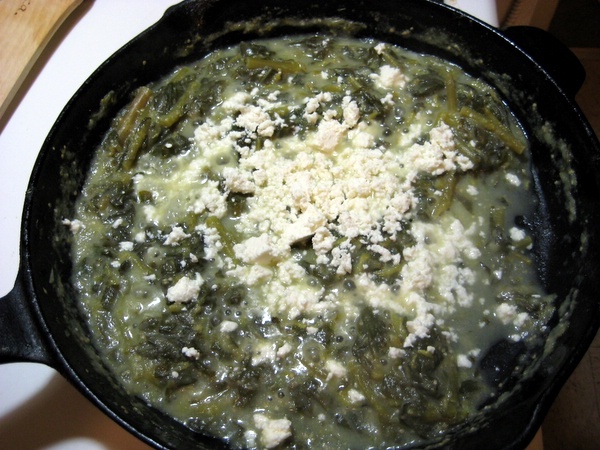 More crappy recipes from EL CHAVO!